Grab your little monsters and go on a haunted house expedition this Halloween—without ever leaving your kitchen. With a few ingredients and easy-to-follow instructions, your crew can construct these goose bumps–worthy Halloween gingerbread houses. They may look tricky to craft, but they’re really a treat—to make AND to eat. Download the Halloween gingerbread house patterns and instructions, Bernard’s gingerbread recipe and Royal Icing now…and get ready to bring on the boos and ahhs! Roll out the gingerbread dough onto a sheet of parchment paper. Place the templates on the dough, and cut out the panels with a pastry cutter, pizza cutter or sharp knife. Transfer the parchment paper to the baking sheets. Bake dough and let cool. Place small pieces of leftover dough on the corners of the parchment paper to keep it from curling up during baking. Pipe a thick line of Royal Icing along the bottom and side of the front panel and along the bottom edge of one side panel. Press the front and side panels together down on the base. Hold in place for a few minutes until the icing is partially set. Repeat with the other side panel and back piece. If you need an extra set of hands, grab some cans from your pantry to help hold the gingerbread panels in place. For the roof, pipe icing all along the top edges of front, back and two sides. Place both roof panels on the structure at the same time, making sure the top edges of the roof panels are touching. Hold in place a few minutes to set. Decorate the shutter fronts with icing, then carefully add a line of icing to the back of the shutters to “glue” the shutters to the front of the house. Hang them askew for a haunted look. Add candies to the front of the house, using the icing as your glue, working carefully around the shutters. Then continue adding candy embellishments to the sides and back. Now you can add candies to both sides of the roof. Candy corn, orange slices and shredded wheat cereal all make great roof “tiles.” Piped icing cobwebs can also be a fun addition. Pipe a thick line of icing along the roof seam and top with a row of candy. Make a path to your front door with a layer of green icing. Then add some crushed hard candies for the paving. Surround your house with icing grass, gumdrop pumpkins and larger candies. Make cookies from any leftover dough in Halloween shapes. Add frosted cookie ghosts, bats and pumpkins for the final touch and to give your house that “lived in” look. Now let the creativity creep in! From more-sweet-than-scary to fully tricked-out, which Halloween haunt will you make? Easy: Candy-covered (and kid-friendly). 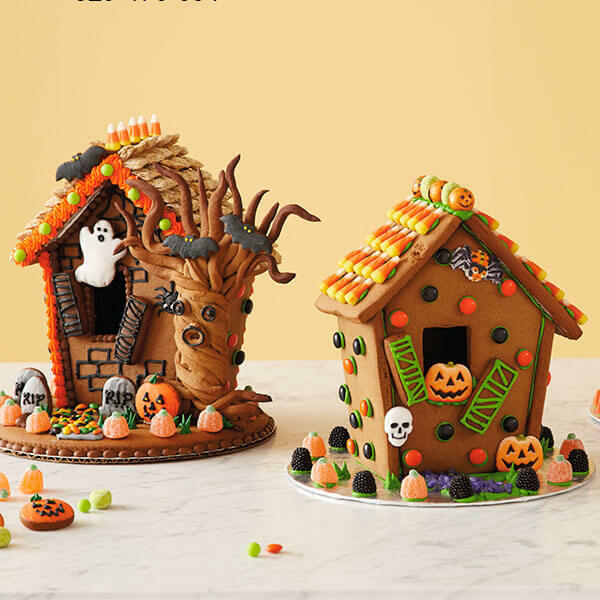 We outlined the steps for this one in the Halloween gingerbread house patterns and instructions pdf (click on the link above to download). Intermediate: A shredded wheat roof, a haunted tree and a little piped brickwork can add more dimension, if you’re feeling extra adventurous. Use different decorator tips to change up the look. When you’re all done with your house but still having fun, create a frightfully fun haunted tree with your leftover dough. Roll it out and start slicing strips—no need for uniformity; crooked lines are perfect. Gather the strips like you’re holding a bouquet of flowers and transfer the strips to a parchment paper–covered baking sheet. Gently twist the strips near one end and softly press them together so they won’t separate during baking—but not so hard you lose their dimension. Working with the untwisted ends of the strips, carefully spread them apart to create the branches—the more curvy and crooked the better. Bake the tree as you did the gingerbread house panels, but add about 10 minutes to the baking time to ensure your tree will stand up straight. Let it completely cool before adding a generous amount of icing to its base. Set it up beside the house and give him a face with a little dot of icing and small candies. By day Bernard helps to run Hallmark's Photo, Video, and Sound studios - by night (and many weekends) he is a passionate hobby baker. 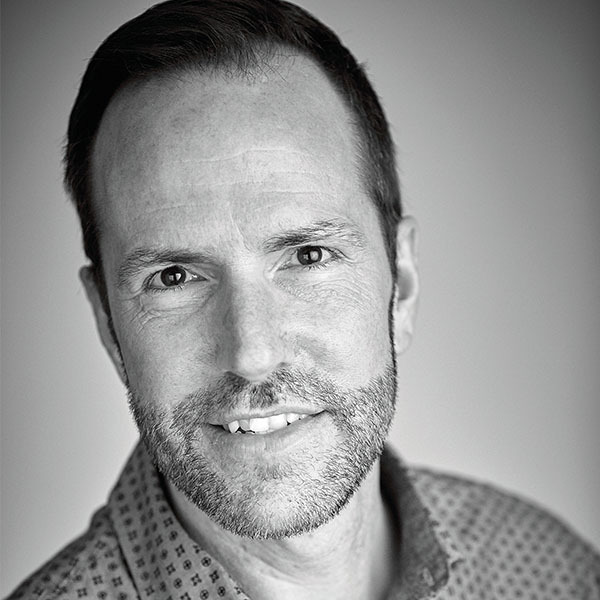 He creates cookies inspired by his favorite greeting cards on the Hallmark & Community series "Cookies & Cards."